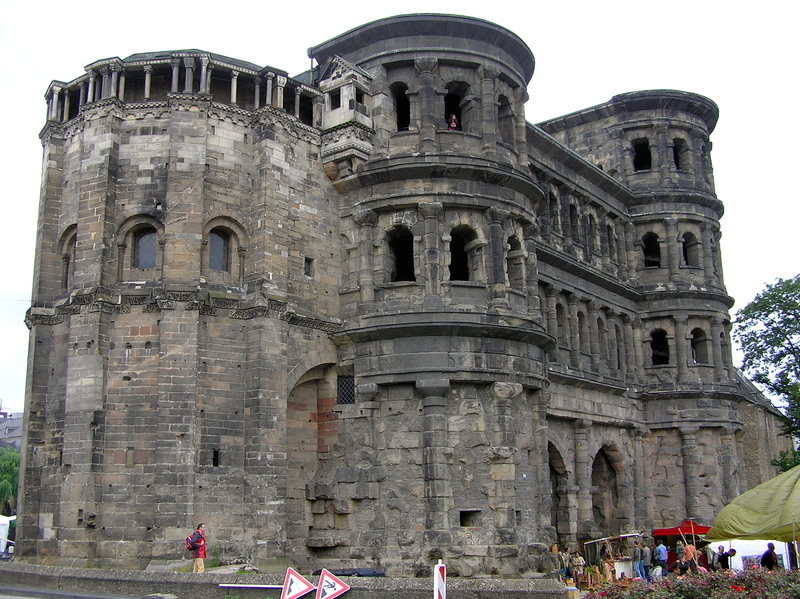 Trier, Germany is notable for its well-preserved Roman ruins. Indeed, some of the buildings I would not even call ruins and are still very intact. 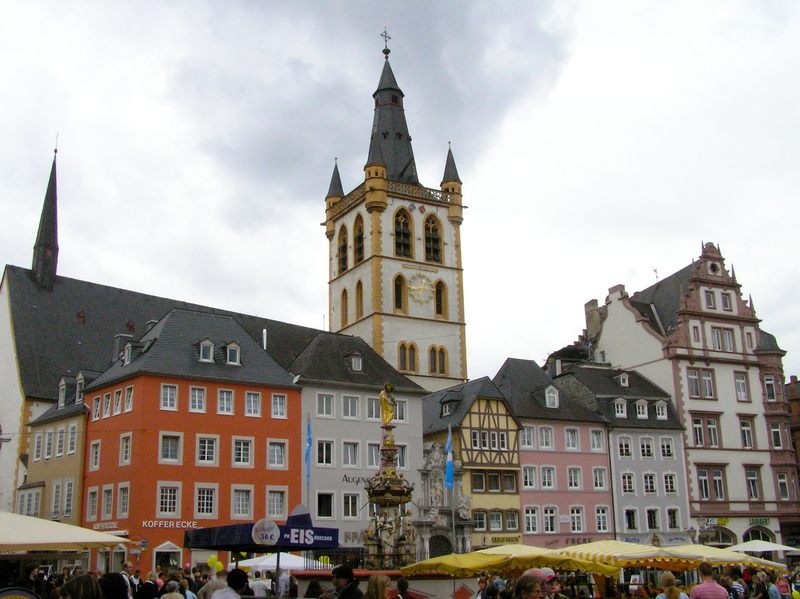 I remember the impressive architecture, but I also remember Trier as the place my daughter got her first taste of “real” food. No, watery rice cereal doesn’t count as “real” food. She stomached the rice cereal once or twice but I couldn’t bring myself to make her acquire the taste, so we moved right on to “real” food, which at six months she was more than ready for. Pausing for dinner at an restaurant surrounded by the medieval city center, it was the season for Spargel Creme Suppe (white asparagus cream soup – a true German tradition). When the steaming bowl arrived at our table and we started slurping it up, my daughter was visibly interested. Many parents can relate to their baby’s intense desire to try big people food. Why not give her a taste? I didn’t pull out my checklist. Let’s see, at what age do I introduce asparagus? Is that before or after carrots? What about the cream in the soup? Is my child going to develop lactose intolerance because she is tasting cream? Can her stomach handle this after only eating a little rice cereal? Will she develop allergies? Will those lead to greater health problems and impact her mental development? Will she be able to do well in school and get good grades? Will she be able to go to college and get a good job?. 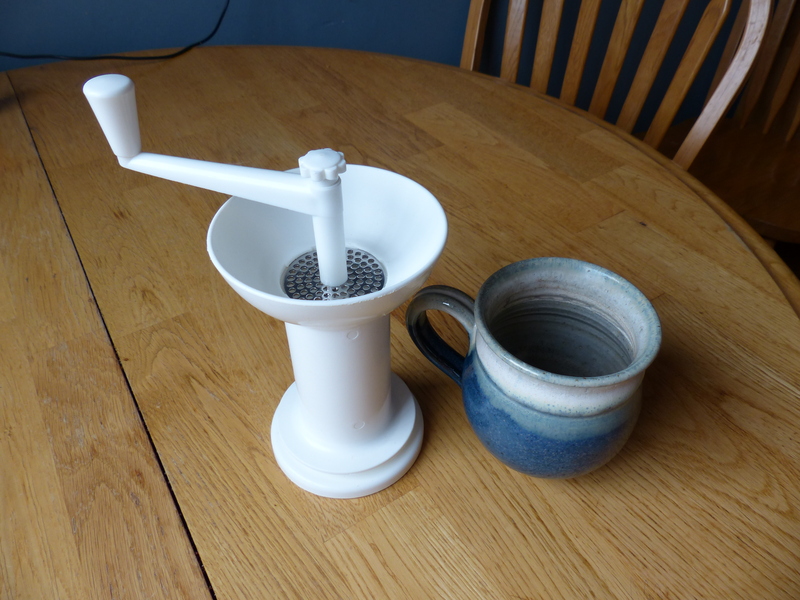 . .
Trusty, indispensable, manual baby food grinder I bought for $10 (pictured next to a mug for perspective). Actually, none of those too-much-reading-and-not-going-with-your-natural-parent-instinct questions crossed my mind. Let the girl try some soup, for crying out loud! It was the perfect texture and she loved it. No, we didn’t let her have the whole bowl, just several tastes, in spite of her protests against moderation. And there was no turning back after that. At home or at restaurants, if it was on my plate, she got at least one bite. Most items I would toss into the small, manual baby grinder we traveled with. This practice made traveling and “what do we feed baby when we travel?” a non-issue. Garlic grilled salmon, spinach curry, bbq chicken – you name it. We threw it in the grinder and baby devoured it. If it didn’t come from our plate and she saw me get it from a separate container that smacked of “baby food,” she didn’t want it. To this day neither of our girls like items on the kids menu. Seriously, who would take mushy, overcooked boiled broccoli over sautéed and seasoned broccolini? Not me! And now, neither will my kids. I did my fair share of reading up on baby before she was born and even purchased “Best Food for your Baby & Toddler” by Jeanneatte Bessinger when my second was born. There’s enough information online and in published material to scare you into never making your own baby food, thinking it’s too complicated to do it “right,” and to decide to only buy organic baby food from a glass jar when it comes time to feed baby solids. And who would introduce anything other than rice cereal for baby’s first food? That’s what everyone says you should do – unless you read the fine print. “While there is no actual research proving that one food is better to start with than another, there are a few foods that most babies traditionally do quite well with” (Bessinger, 93). Ha! No research. Tradition. “Most” babies. What follows is three pages of information on allergies, hypersensitivity, deadly allergies and foods to avoid. That’s scary stuff – enough to make any parent throw out common sense and read the following two hundred pages to make sure they do everything “by the book.” Of course, you have to make sure you’ve picked the “right” book. What about the other thousand websites and books that present other views? One website says the “forbidden baby food” list is too expansive. It quotes a study that states “there is no convincing scientific evidence that avoidance or delayed introduction of potentially allergenic foods, such as fish and eggs, reduces allergies, either in infants considered at increased risk for the development of allergy or in those not considered to be at increased risk.” Did you know in Israel it is common to feed infants peanut products? Did you know in Germany it is common to feed eggs to infants? In fact, in January the “rules” in America were changed and now parents are encouraged to introduce all those allergens (peanuts, eggs, milk, etc) before 12-months (see related articles after the photos). My point? We can read and read and fret and read and ask other moms and read more and talk to different pediatricians with different opinions then read some more and then just be paralyzed and resign ourselves to spending inordinate amounts of money on prepared organic baby food from a glass jar. Or, you can read, ask for some opinions and do what you think is best for your child and your family. Just don’t let fear guide your parenting. That takes out all the fun. Like the fun we had, sitting in a medieval square, giving tastes of asparagus cream soup to our 7-month-old and watching her squeal with delight. Asparagus season, known in Germany as spargelzeit, begins in April and lasts about two months. One of the best asparagus festivals (there is a festival for everything!) takes place in Schwetzingen, Baden-Wurrtemburg, at some point during the first week of May. It is complete with music, parades, the crowning of the asparagus king and queen and, of course, lots of asparagus of the white variety, which Germans prefer. For all you want to know about Germany’s asparagus tradition, and more, check out this website from a Taste of Europe. 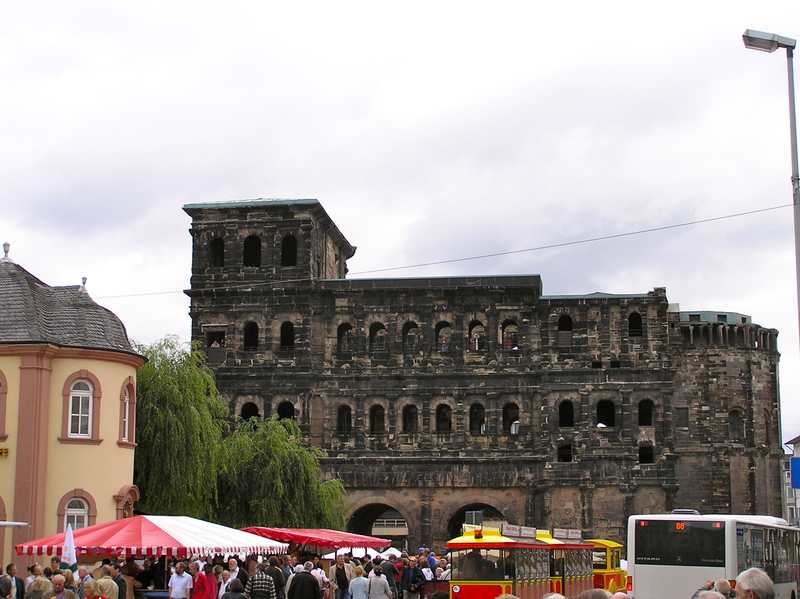 I recommend Trier to anyone traveling the western regions of Germany near the Luxembourg border. The Roman ruins at this UNESCO World Heritage Site are some of the most well-preserved in Europe. Plenty of cultural events take place year round, including the medieval market, which takes place this weekend on Saturday and Sunday. Stop by if you’re in the area! 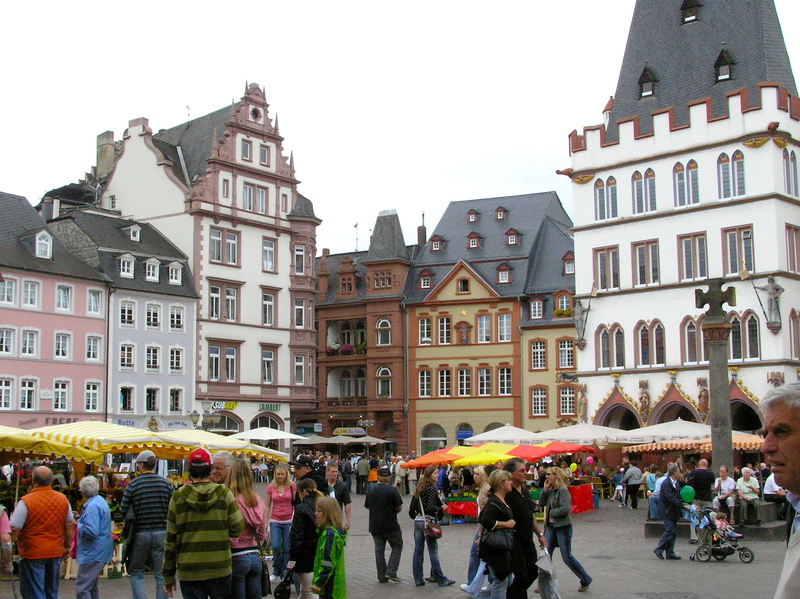 These photos were taken in the fall, not during our spargelzeit visit to Trier. Enjoy! Oh my goodness, I can completely relate! I’m always torn between wanting to read all the helpful baby info out there and then not wanting to read it because half the time it freaks me out. By the way, asparagus is my absolute favorite vegetable. I want Simeon to love it too (I think he does) but I also find myself not wanting to feed it to him as often because it always makes his pee smell horrible!!! 😛 But an asparagus festival sounds fabulous! I know that smell:-) How about changing a diaper after eating beets? There’s a good one. Apologies to readers who don’t have small children and are not in the diaper-changing phase of life. When asparagus is in season in Germany you can’t go out to eat anywhere where it is not served in some delicious fashion. It’s definitely a treasured, valued vegetable. I’m glad you agree! I agree Heidi. Our culture seems to thrive on instilling fear. It isn’t just in the realm of baby rearing. Indeed. Our culture is not unique. I think living in fear is the path of least resistance and is the default reaction for all people. I can’t remember ever buying baby food, but probably did a bit. We pureed everything we ate, fed it to our daughter, froze the rest in ice cube trays. A cube each of frozen pureed broccoli, chicken, potato, whatever, made a quick meal later in the week, thanks to microwaves. And they traveled easily in a thermos. Although my family had a history of food allergies, my daughter has none, at age 26, and has always loved vegetables. I opine that it’s because she only had the good stuff. I love the ice cube tray method. If I have small amounts of leftovers I would grind them up and they would go in the ice tray. I prefer frozen food over canned/bottled/pasteurized, which is what baby food in a jar is. I think frozen tastes better. Now, I did always have a jar of store bought baby food on hand in the diaper bag for emergencies. There are times at restaurants when what we eat just won’t work in the grinder (salad, steak, hot-spicy, etc). I’m not opposed to store bought babyfood, I just think there are a lot better options out there that can teach your kid to be a healthy, adventuresome eater! And I’m so glad your daughter never developed allergies! One of the articles linked at the bottom of the blog talks about how introducing all the “forbidden foods” before 12-months has now shown to possibly prevent some of those allergies or intolerances. Who really knows. . . The point is, don’t live in fear of them! Do you know anything about spices? I am just curious – I’ve been in Asia 8+ years now and have seen mothers give their kids everything from Wasabi peas to kimchi to curried rice (guessing that would not be okay in the States?) and following their example, never stopped eating most foods here during pregnancy. But I am curious if there is any mention of what age to introduce stuff like that? I haven’t seen any mention of what spices to introduce when. Most babyfood and kid food starts out BLAND and stays that way. I have seen some literature that recommends adding small amounts of cumin or some other individual spices to pureed vegetables to add flavor (not salt). The only spices I didn’t feed my kids before they were 1-year-old were things that were hot-spicy – hot sauce, etc. After that, if they looked like they wanted to try it, I gave them small bites. For both girls, when they first tried something hot-spicy they teared up, breathed heavily with their mouths open and, just before I thought they were going to cry, they said “more!” That’s their reaction to wasabi peas too. My three-year-old also asks for hot sauce on her food when she sees me use it, often in my curries to make them a little hotter on my plate. I don’t make it too hot, but I do give her some. And one of the first foods they both ate and still devour to this day is curried lentils (not hot-spicy) and rice – cheap, healthy and full of flavor!